Booming business is all very well, but the Indian healthcare centre is in the midst of a crisis. 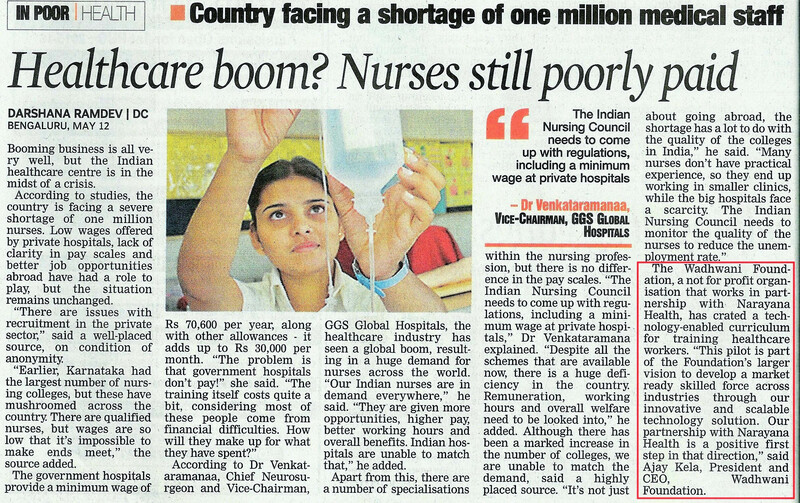 According to studies, the country is facing a severe shortage of one million nurses. Low wages offered by private hospitals, lack of clarity in pay scales and better job opportunities abroad have had a role to play, but the situation remains unchanged. “There are issues with recruitment in the private sector,” said a well-placed source, on condition of anonymity. Earlier, Karnataka had the largest number of nursing colleges, but these have mushroomed across the country. There are qualified nurses, but wages are so low that it’s impossible to make ends meet,” the source added. According to Dr Venkataramanaa, Chief Neurosurgeon and Vice-Chairman, GGS Global Hospitals, the healthcare industry has seen a global boom, resulting in a huge demand for nurses across the world. “Our Indian nurses are in demand everywhere,” he said. “They are given more opportunities, higher pay, better working hours and overall benefits. Indian hospitals are unable to match that,” he added. Apart from this, there are a number of specialisations within the nursing profession, but there is no difference in the pay scales. “The Indian Nursing Council needs to come up with regulations, including a minimum wage at private hospitals,” Dr Venkataramana explained. “Despite all the schemes that are available now, there is a huge deficiency in the country. Remuneration, working hours and overall welfare need to be looked into,” he added. The Wadhwani Foundation, a not for profit organisation that works in partnership with Narayana Health, has crated a technology-enabled curriculum for training healthcare workers. “This pilot is part of the Foundation’s larger vision to develop a market ready skilled force across industries through our innovative and scalable technology solution. Our partnership with Narayana Health is a positive first step in that direction,” said Ajay Kela, President and CEO, Wadhwani Foundation.